How Do Chemical Peels Work? What Can They Treat? 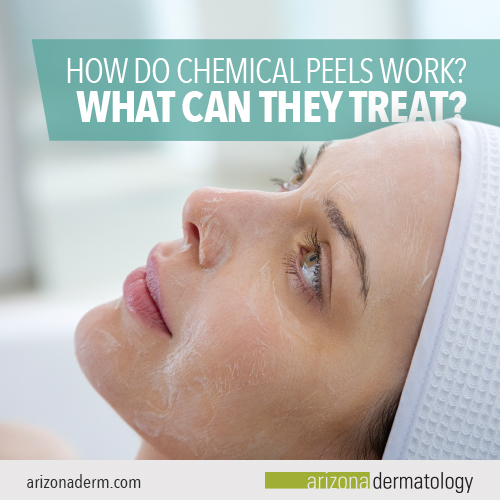 Chemical peels are one of our most popular services at Arizona Dermatology. Patients of all skin types enjoy the flexibility of choosing a peel that’s right for their skin and the noticeable results that a peel brings. If you’re considering a chemical peel, it’s important to know the specifics of what a peel is, how it works, and how it can benefit your skin. A chemical peel is a procedure that’s used to improve the appearance of the skin. This is done through the controlled application of chemicals to the skin. Chemical peels come in various depths and strengths. Light chemical peels treat the outer layers of the skin, while strong chemical peels penetrate deeper into the skin’s surface. Chemical peels work with the help of acids within the peel that raise the acidity of the skin to around a 3.8 pH level. Normally, skin has a pH of around 5.5, and changing the pH level chemically loosens the cells that form the “glue” between dead skin and healthy skin. With that bond chemically loosened, exfoliation occurs as dead skin is removed to reveal healthy skin underneath. This process promotes the growth of new, healthy skin cells. Most chemical peels contain one of the two following categories of chemical exfoliants. Alpha hydroxy acids, or AHAs, are naturally occurring substances derived from foods. For example, citric acid is found in citrus fruits, and lactic acid is found in sour milk. They exfoliate the skin by loosening the surface layers. AHAs are useful for the treatment of uneven skin tone, scarring, hyperpigmentation, and acne. Beta hydroxy acid, or BHA, is also known as salicylic acid. While AHAs work to loosen the surface layers of the skin, BHA works to penetrate the pores of the skin and dissolve the oil, dirt, and debris in them. This makes BHA effective for fighting acne, oily skin, and other skin irritations. Who is eligible for a chemical peel? Chemical peels can be customized to accommodate any type of skin, including sensitive skin, making the procedure safe for most skin types. Patients with darker skin may have to take precautions before getting a peel to ensure the peel is safe for their skin tone. This is because some chemical peels can increase hyperpigmentation in darker skin. Chemical peels are an effective treatment for many skin conditions including sun damage, hyperpigmentation, and acne. They’re also often used to treat melasma, a pigmentation disorder. Chemical peels also reduce the risk of certain skin cancers. Chemical peels remove the top layers of skin, including the epidermis, where the majority of precancerous growths develop. According to the Skin Cancer Foundation, chemical peels can be used to treat actinic keratosis, a potentially cancerous lesion that develops due to sun exposure. Chemical peels cannot treat deep facial lines or wrinkles, or tighten loose and sagging skin. They also cannot remove deep scars. For patients looking to address these issues, we offer a variety of cosmetic services. Each chemical peel offered at Arizona Dermatology is unique and can be used to treat a variety of skin conditions. By understanding what each peel does, you can make an informed decision on which one is right for you. The perfect peel is the heaviest peel we offer. By working deep into the layers of the skin, this peel works to repair, replenish, and leave skin with a renewed glow. Even though it is a strong peel, patients can expect to feel little to no discomfort during the 30-minute application process. This powerful peel is safe for all skin types and is gentle enough to be used every three weeks. The vitalize peel helps to fight the effects of age, sun damage, and environmental damage to the skin. This light peel uses a mild alpha and beta hydroxy acid formula. With no downtime and quick results, the alpha beta peel is recommended as a “lunchtime peel.” Patients are generally able to return to their normal activities immediately after. The glycolic acid peel is one of the most popular and lightest peels we offer at Arizona Dermatology. This natural peel derived from sugarcane delivers long lasting results, and can help to improve the appearance of uneven skin texture and tone. The salicylic acid peel is a light chemical peel that’s useful for killing off acne causing bacteria in the skin. This peel acts as an antiseptic exfoliate that deeply cleanses the pores of your skin. This peel is a mix of acids including lactic, salicylic, and resorcinol. The depth and aggressiveness of the modified Jessner’s peel can be customized depending on the patient’s skincare needs, as it’s applied in multiple layers. What can you expect during a chemical peel? During a chemical peel, the solution is applied to your skin using a sponge. The solution is then left on your skin for a period of time—this may be longer or shorter depending on the depth of the peel, and the sensitivity of your skin. After, the solution is washed off your skin, and your skin will be neutralized with a cooling compress. Following the chemical peel, the technician will go over your aftercare instructions to make sure you understand what to expect during the recovery period. The amount of downtime needed for a chemical peel depends on the strength of the peel. For example, a superficial peel can have a quick recovery time of under a week. However, a more aggressive peel that treats deeper layers of the skin may require one to two weeks of recovery time. During your recovery period, your skin may become dry, peel, or get irritated. Because of this, we recommend scheduling your chemical peel several weeks in advance of big social events. When recovering from a chemical peel, your skin will be very vulnerable to the UV rays of the sun. Because of this, it’s important to take steps to protect your skin from these harmful rays. We recommend using a sunscreen with at least SPF 30, and avoiding the sun while it’s at its strongest, between 10am and 4pm. For many patients, chemical peels are a great first step towards having clear, radiant skin. For others, treatments such as microdermabrasion, dermaplaning, or micro-needling can deliver their desired results. No matter what the case, we strive to provide the best possible experience. If you’re interested in getting a chemical peel, or have other skincare questions, contact us today. Our friendly staff would be happy to meet with you at a consultation appointment to discuss your skincare needs.